Most of what you know about yourself is wrong. It is worth taking a few hours to find out how wrong you are. The ideas you have about your strengths and weaknesses are based on thinner evidence than you could ever imagine. A quality you say you have held all your life, something about yourself you’ve told people a hundred times, might be an opinion formed from a small number of episodes that occurred in your childhood. Maybe there were five stories that seemed to confirm this idea, or maybe just one or two. They happened a long time ago. You can’t remember them accurately. You’ve changed in the years since. They’re hardly enough to hang a self-image on. Suspense had a moment in social media yesterday. One of the biggest catch phrases of the day was “Eventually we will get something done.” This happened after a news organization attributed this statement to a prominent U.S. political figure. I don’t know if it was an accurate verbatim quote or just a summary of a position, and it’s fair to guess that most people repeating the line hadn’t checked either, but it scarcely matters. It’s a rip-roaring statement if you take the liberty of reading it at face value — “eventually” implies that so far and on most days, we don’t have a prayer of accomplishing anything, while “we” implies the hope that someone else will step forward to do the heavy lifting. Nothing will change, in this view, until future good luck and better circumstances finally allow action. Coming from a man who sees himself as a leader, this kind of statement is practically an abdication, and that’s where the humor in the statement lies. Imagine yourself saying something similar about your own life, though, and the humor vanishes. The feeling of waiting and waiting, while not doing anything, is all too true to life. Here is my new cutting board. It was hand-made in Cameroon, the tag tells me. It couldn’t be clutter, could it? Not in my kitchen! I will be using it every few days. Logically, though, if I am using the new cutting board, that means there must be an old cutting board I won’t be using. That is another paddle cutting board, made of bamboo rather than wood. After years of use, it is too ugly to show here. The old bamboo cutting board will be going in the fire. Whenever you’re happy with a new purchase, think of the old item it displaces — that might be one you are ready to get rid of. Suzanne sent an update to show that she is still finding change. The photo shows $12 in dimes stacked up from the coins she rounded up this afternoon. Change is not an accident or a fluke. Once you start the process and get in the flow, change keeps happening. Look up. What do you see? Is it a bird? Is it a plane? No, chances are, it’s a ceiling, the part of the room that is most likely to go unnoticed. Suzanne is a change magnet. 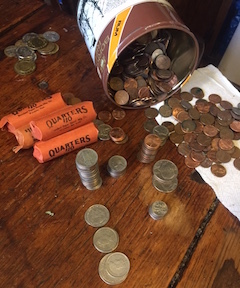 She is not only changing her surroundings by removing clutter, but she is finding change — coins, that is — in unexpected places as she goes along. It’s funny to think of money as clutter, but that’s what it is when it is so disorganized you wouldn’t think of spending it. 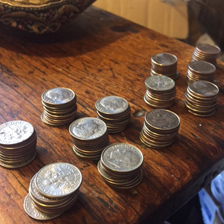 Organized into $10 rolls, the stray quarters turn into something you can do something with. 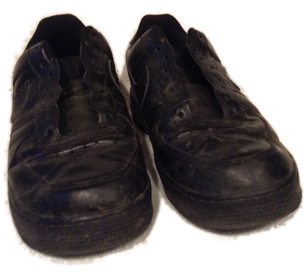 Here’s a conundrum: shoes with no shoelaces. What do you do with something like that? There was a major winter storm here this week. My clutter-busting on Tuesday consisted of removing unwanted snow mixed with sleet from my car and the pavement in front of it so that I would be able to drive again when the roads improved on Wednesday. By the time the snow ended, it was dark, and I never got around to shoveling the snow away from the back door. The snow froze solid Tuesday night. Ever since, I have not been able to open the back door. I mentioned my miniature square plates so here they are. To put them in context I need to show the four sizes of plates I have, so the picture shows one of each. 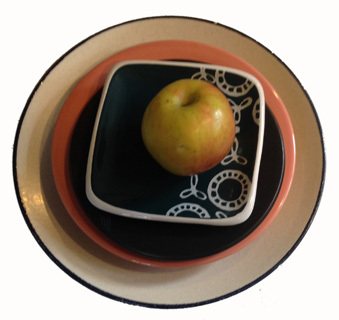 From largest to smallest, they are the dinner plate, small plate, dessert plate, and miniature square plate, along with a small apple to provide a sense of scale. Traditionalists will see the problem immediately. On the traditional American table there is no use for four different sizes of plates. Indeed, you can get by with one size if you insist. That would be the small dinner plate, a size in between the dinner plate and the small plate. More conventionally, you would have two or three size of plates, but probably not four. This town ain’t big enough for two bowls. Okay, that’s a little melodramatic, but that’s what it can feel like when you realize you have two nice items in a category where one is all you will ever use. 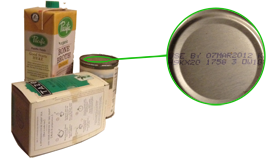 On the right side of the Spotlight Scorecard, you’ll see a small section labeled Value. It’s about the size of a miniature business card, with four vertical bars for marking specific qualities of an item. It’s probably not immediately obvious what this section is for or how to use it. Sometimes something is just worn out. 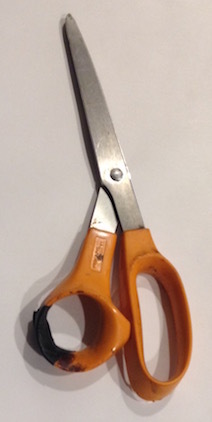 That especially describes this pair of scissors. Any way you look at them, they’re pretty old. I’ve been using them for more than twenty years. The handle broke last year and is held together with gaffer’s tape. There are stains. Most of all, though, they don’t cut the way they used to. After the last big project a couple of weeks ago, the edges are so dull it takes an extra effort to cut a plastic bag. After so many years, it can be hard to believe that something is actually used up, but that was undeniably the case here. It was time to throw these scissors away. We keep many of our things with the story that we will eventually use it so much that it will be broken or worn out and then we’ll have to throw it away. It’s a disappointment when it goes to pieces on its own — not from being used but just from the passage of time as materials deteriorate. Each clutter spotlight this month will show a different kind of clutter. The idea is to provide examples of the kind of thinking that goes with clutter-busting. For the first clutter spotlight, I’m spotlighting something from my own office. It’s a problem item I was looking at last weekend. It’s a controller keyboard, a professional musical instrument. It’s MIDI- and USB-compatible. It’s just what I need. And it’s clutter — not because I don’t use it or don’t need it, but because it’s in the wrong place. I have it set up on a cart next to my computer. It’s there all the time. And that’s the problem. The March of Trash Spotlight Scorecard, which you can download from the March of Trash challenge page, invites you to examine your possessions one by one, as if you had a spotlight that you could shine on one possession at a time. 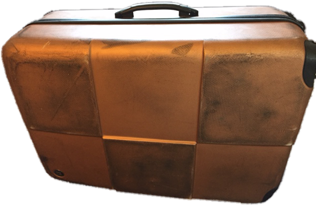 The scorecard is particularly relevant for the possessions that you haven’t been using. Anything you have that you don’t use is clutter, but different things can be clutter for different reasons. A video cassette recorder, to cite one example from my own house last year, can become clutter because it is obsolete technology, because it no longer works, or just because you’ve forgotten you had it. Maybe all these reasons apply. On the scorecard, you can check off the difference between one kind of clutter and another. It’s March and time for the March of Trash challenge. We all live with clutter every day — well, nearly all of us do — and sooner or later, we have to stop what we’re doing to focus on getting rid of some of the clutter in order to save our space and our sanity. There are many ways to look at the challenge of clutter-busting, and this year’s March of Trash focuses on the way you look at a specific item and decide whether it is worth keeping or better thrown away. To help with this, I’ve created an all-new March of Trash 2017 Spotlight Scorecard. Read all about the March of Trash challenge at the March of Trash challenge page and download the Spotlight Scorecard at the bottom of the page. Use the Spotlight Scorecard to sort out what happens to something you have found among your stuff that you suspect you won’t be needing or using. I’ll explain the key details of the scorecard in tomorrow’s post.